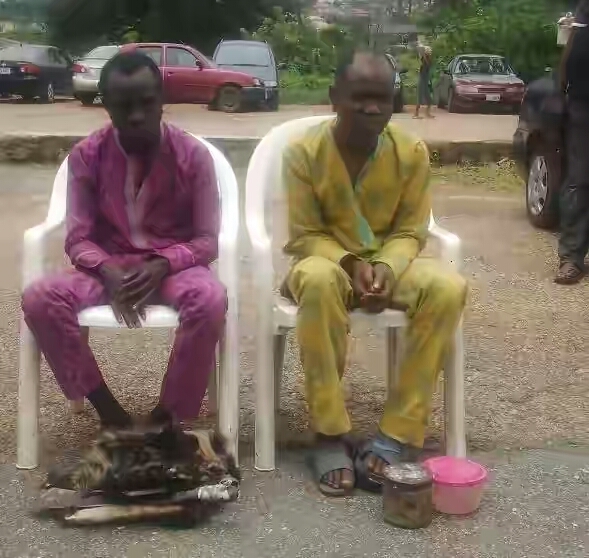 Luck has ran out on two suspected money ritualists after they were caught with human flesh in Oyo state by the police. The two suspected ritualists were identified as Murtala Aliyu (30) and Saheed Raji (40). The state police commissioner, Mr Abiodun Odude said the Federal Highway Patrol team on a stop and search along Ogbomoso-Ilorin Highway, first arrested Aliyu in a commercial vehicle around 6:20p.m. on August 9, with a piece of flesh suspected to be human part. “Aliyu, an Arabic teacher, later confessed he was given the flesh by Raji for money rituals; the second suspect was subsequently arrested at Idumota in Lagos State,” Odude said. In his confessional statement, Raji, a herbs seller in Idumota, said he contracted the Arabic teacher (Aliyu) to help him make charms that would make him record faster sales. Also, a fake UCH medical doctor was apprehended by men of the police in the state. Parading the suspects, Odude promised that policemen would continue to work towards ensuring peace and tranquility in the state. Speaking during the parade of the suspected criminals at the state police headquarters, Eleyele, Ibadan, Mr Odude said the 40-year-old fake medical doctor, Orimisan, had been parading himself as a staff of the University College Hospital (UCH), Ibadan. “The suspect, who claimed to be knowledgeable in curing some ailments through herbs, had been obtaining money from owners of chemist shops in Ibadan under the guise of checking for fake drugs. “The suspect had gone to a drug store at Abanla village in Idi-Ayunre, in Oluyole Local Government Area of the state and fraudulently collected some drugs and money. “A report was thereafter made to the Idi-Ayunre Police Division, which eventually led to his arrest. “Further investigation carried out by detectives attached to the Criminal Investigation and Intelligence Department (CIID) revealed that the suspect was expelled from the Delta State University College of Medicine due to his poor academic performance. “Items recovered from him included a fake Nigeria Medical Association (NMA) identity card, a stethoscope, a pair of white overall and some certificates suspected to have been forged or stolen,” the police commissioner said. However, while speaking, the suspect-Orimisan, said he was invited to Abanla village to treat a lady, and after he was done, he saw a patent medicine store owner and went there, introducing himself as a staff of UCH, and that he had been sent to check the validity of their drugs. “The lady then invited the police, and that was how I was arrested,” Orimisan said. On the certificates found with him, the suspect said they belonged to some of his friends, who were searching for jobs at the UCH, and that was how he had possession of the certificates. According to Tribune, the suspect admitted that after he left the Delta State University College of Medicine, he travelled to Kumasi, Ghana, to learn herbal medicine for two years, and he became a specialist in treating fibroid, arthritis, hernia, among other illnesses. He said it was the devil who made him approach the medicine store owner on the day he was arrested, claiming he was a medical doctor. The police commissioner said that all the suspects would be charged to court upon completion of investigation into their cases.